Looking for private in-home or in-studio Trombone lessons? Our Rego Park teachers are ready to get you started. Find your teacher today! Greg loves music and inspiring others to love it too! While teaching music, he also teaches his students to work hard to reach their goals while having fun along the way. Awesome professional! My trombone students start with the fundamentals of breathing and forming an embouchure. In other words, we start with how to shape your face in order to give you the most beautiful sound you can get. You will love listening to yourself play in no time! I have been happily playing music for 20 years, and now I have the opportunity to share my enthusiasm with you! I have been a public school music teacher for the last 8 years, primarily teaching elementary school instrumental music. I graduated from the University of Delaware Bachelor of Music, majoring in music education with a trombone concentration and minoring in classical guitar performance. My musical journey started with guitar lessons at age 8. Although my degree is in classical music, I have played many genres of guitar, including pop, rock, and jazz, in many different settings. I've played with bands as well as solo material, so no matter what you want to learn, I will be able to shed some light on your path to being the kind of guitar player you want to be. years. I've played trombone in quite a variety of ensembles, including brass choirs, trombone choirs, wind ensembles, jazz bands, and brass quintets. I've spent four summers touring with a World Class Drum and Bugle Corps playing baritone and honing the fundamentals of great brass playing. She is on time, and is very patient with children, she likes her very much. Great teacher, very patient who starts with the basic knowledge of music reading ability.Thank you! The trombone is a colorful and exciting instrument played in many styles of music throughout the world, from jazz and classical to funk and soul to reggae, afro-beat, and Latin American music. 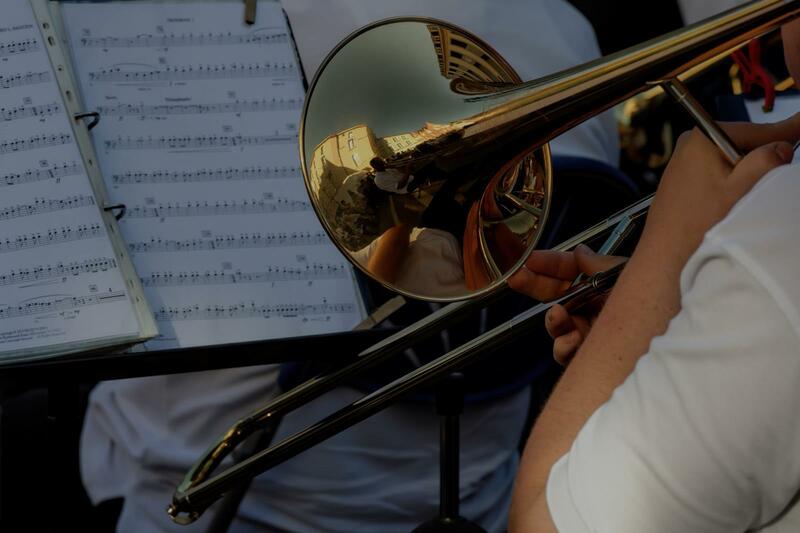 In addition to covering the basic technical requirements of the instrument, I'm particularly interested in the many genres in which the trombone can be found, and I like to focus on the styles of music that most interest and challenge my students. I began playing soprano trombone over ten years ago, and I have taught tenor trombone privately and in public school programs for several years. I encourage the use of long tones, air support, and brass calisthenics to improve tone, increase range and endurance, and work towards greater flexibility. I am a jazz trumpeter, improviser, and composer as well as an avid listener and enthusiastic educator. I maintain an active performance schedule playing improvised music as well as funk, soul, afro-beat, reggae, hip-hop, and American folk music. In addition to trumpet, I have experience performing and recording on slide trumpet, trombone, baritone horn, and french horn. I write and arrange music for my own groups and regularly write and record horn arrangements for folk, pop, and reggae groups. I have attended Berklee College of Music and Ithaca College, and I have a Master's degree in jazz trumpet performance from the New England Conservatory of Music in Boston. s including the Hudson Arts Alliance in Hudson, MA, the Kittredge Elementary School in North Andover, MA, and the Performing Arts Center of Metro West in Framingham, MA. I have studied jazz performance with trumpet greats John McNeil and Walter White, improvisation with jazz gurus David Schumacher and Jerry Bergonzi, and George Russell's Lydian Chromatic Concept of Tonal Organization with master composer and theorist Ben Schwendener. As an educator, my aim is to inspire in my students an enthusiasm for the artistic performance of music of any style. I strive to convey my own excitement for the art to young trumpeters and improvisers, and I have worked to encourage self-motivation and a longstanding interest in musical self-expression in elementary through high school students and adults. I have experience performing many styles of music from jazz and experimental improvised music to funk, reggae, and afro-beat, and I use my knowledge of divergent genres to encourage creative experimentation and convey the expressive artistic elements shared by all music. As an improviser I am particularly interested in teaching the theory and philosophy of spontaneous composition and musical communication. My son really enjoyed his first lesson! Bobby was very supportive and encouraging. Bobby was very patience,and an excellent instructor .We were on the same page. Students will be taught how to create a relationship with the the trombone and allow it to become a vehicle for there own creativity. Through teachings of tension free and relaxed technique I hope to bring the student to become magicians of the instrument so that the magic of making music becomes reality. Hello! I am a trombonist, educator, composer, and producer. I started learning music when I was in middle school and have adopted it as my lifestyle. I spent most of my initial studies under the wing of Weston Sprott; Principal trombonist of the Metropolitan Opera. Now, I am a full scholarship graduating student of the Manhattan School of Music and a full time member of the 6 time Grammy winning Afro Latin Jazz Ensemble led by maestro Arturo O' Farill. Support also comes to me from my sponsors/endorsers Antoine Courtois. I perform at venues all over NYC both as a sideman and a band leader! Music is a gift and it is meant to be shared! I hope that I could have the honor of sharing that with you and that we may grow together. Amazing teacher, has incredible talent at teaching and playing music. I know that he will be able to help me to be the best musician I can be. He did all the right techniques to get good and it shows in his playing. Overall great teacher and a great guy, really cares about the growth of the student. I’m an experienced trombone player who can play in a variety of different styles, and has experience working with beginner students and helping them learn. Music is a great passion for me, and I want to share that passion with others. It should be a fun and rewarding experience. Send me a message to talk more! Hello! I’m an experienced trombone player who’s passionate about music and loves sharing that passion with other people. I’m familiar with a variety of styles of playing, and I know what skills and lessons are most necessary for beginners. Send me a message if you think I’d be a good fit! , and friendly. I was a little worried that a professional like him would laugh at the embarrassing skills of an adult like mine - didn't happen. He was down to earth despite his great playing, kind of more like a friend or a big buddy rather than a teacher. I think our lesson brought me much improvement! He also taught me some helpful daily practice routines. Another little touching detail was he provided me with free drinks and snacks, something none of my other teachers have done before. His studio was also fully equipped: it has a piano, great stereo, stands, and music books." sonable and productive way. - Michael"
azz band music. I highly recommend him!" New York, NY teacher: Chris P.
New York, NY teacher: Reut R.